For the last couple of years, I have been the guest of several economic and Chamber of Commerce organizations to visit their region to tour manufacturing plants and write articles about their region’s industries, but two weeks ago, I was invited to visit an industrial park right in my back yard ─ the Carlsbad Gateway Center, a Makers’ place with over 80 businesses in a 16.5 acre business park (Carlsbad is 25 miles north of San Diego). “We started the company six years ago to design, build, sell and support ARM Cortex-A and Cortex-M System-On-Modules (SOMs), which are micro controller systems programmed with Linux.” Emcraft is a California LLC headquartered in Carlsbad, and with an engineering office in Moscow, near Moscow State University. Emcraft partners met in Silicon Valley in 1998 while working on a Posix real-time operating system, and the relationship has lasted across several companies and cities. In addition to Emcraft Systems, Meyer is involved in local STEAM education. He has worked with local schools and the Carlsbad Education Foundation (CEF) to teach robotics and programming to youth. CEF is a 501(c) (3) non-profit organization that provides private support for public education programs throughout the Carlsbad Unified School District. 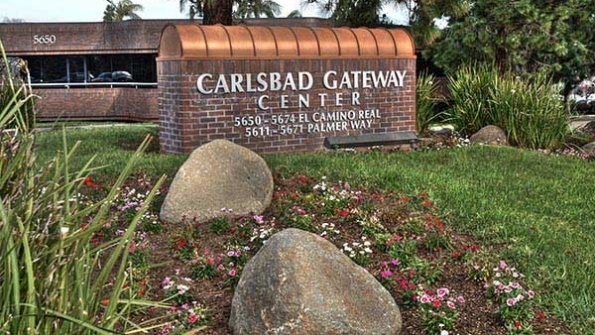 The foundation is also located in the Carlsbad Gateway Center. He said that they recently developed an “IoT Educational Platform” using Chromebooks, Linux, MQTT and Node-Red to see what kids might come up with when taught IoT concepts. The effort culminated in a presentation to the Carnegie Mellon SATURN conference in San Diego, where the kids showed a highly interactive MQTT platform of over 60 nodes all communicating and collaborating (robots, drones, lights, toys, etc) and connected to Skype and email over Node-Red. The effort won Meyer and the team the distinction of “2016 Top Embedded Innovator” by Embedded Computing Designmagazine. Click on this link to read the interview with Meyer after the award. Next we met with Dr. Robert Boock, CEO/CTO and co-founder, of Glucovation. Dr. Boock previously served as the senior technical director of Research and Development at Dexcom where he was responsible for managing the research and development of Dexcom’s CGM membranes and biotechnologies. He was part of the group that developed materials for Dexcom’s SEVEN PLUS. He was a co-inventor of the G4 PLATINUM sensor and was a key player in its development and commercialization. He holds more than 44 patents and over 100 pending patents as well as having more than 25 peer reviewed journal articles. Our last meeting was with Martin Bouliane, founder and president of R&3D Engineering. He is a mechanical engineer who started his career in 1993 involved in product development. He worked with Cirque du Soleil for a while as a product designer. He was previously the owner of R&3D Engineering in Canada, where the company was primarily focused on consumer product design from 2000-2007. He moved from Quebec, Canada to California in 2007. This interview was eye opening to me because I had seen very little automation or use of robotics in local companies with which I do business. The main reason is that 97% of San Diego County advanced manufacturing businesses are companies with fewer than 50 employees. Another reason is that I do not do business with biotech companies as they do not buy the type of fabrication services I represent. I recruited Bouliane to speak at our upcoming March Tech San Diego Operations Roundtable event on the subject of the advances in robots, automation, artificial intelligence and machine vision. He will also discuss the future of automation and robotics and give his opinion on whether jobs will be lost or created. There is a wide divergence of opinions on the answer to this question, so it will be interesting to hear his opinion.